With the presidential election scheduled for early next year Temple Trees is a hive of activity, with arrangements being made for President Mahinda Rajapaksa to meet various groups of people. 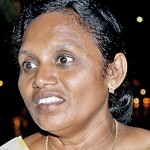 “I had the best meal ever in my life today,” said 68-year-old P. Siriyalatha, a mother of two daughters. The added joy for her, she said, was eating the food in the presence of the President. Siriyalatha whose daughters are employed in Cyprus was one of among 3,000 guests at Temple Trees yesterday. The event, which Mr. Rajapaksa addressed, was for the next of kin of those employed abroad. They were invited by the Ministry of Foreign Employment. Earlier, he had similar meetings with sports officers, police officers, teachers, nurses and Samurdhi officers. 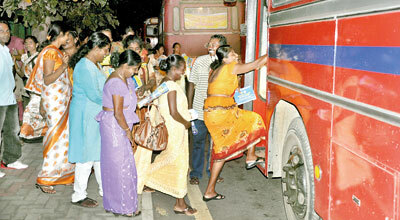 Parked around the Beira Lanka, just near Temple Trees were CTB buses that had transported people from distant places like Bibile, Jaffna, Anuradhapura, Buttala, Matale, Galle, Hambantota and Trincomalee. working abroad, ” she said, clutching the leaflets distributed at Temple Trees.K. 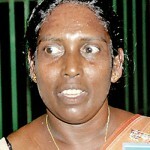 Pushparani from Kantale, said the President came up to them and asked about their grievances. “I wore my best saree. Some people cried at seeing the President. I’m going to open a shop, once the loan is approved,” she enthused.Mary Theresa from Puttalam said that she had been in the Middle East for eight years, but had not been able to save money for herself to start a business, but now she would be able to. More such gatherings at Temple Trees have been organised to take place in the next few weeks. Application for admissions to State-run Universities to go online: UGC Addl. Sec.